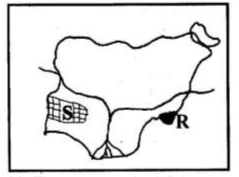 Use the map below to answer question 1 to 5. 1. The inhabitants of Abu are most likely to be ___. 2. The distribution of settlements in the area is mostly influenced by ___. 3. The spot height on the map is ___. 4. The area can be described as a ___. 5. The feature shown north of Abu is ___. 6. A map with a scale of 1:40 000 is reduced to one quarter of its size, what is its new scale? Use the diagram of below to answer question 7 and 8. 7. 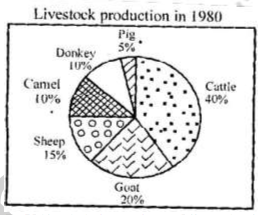 If the total number of live-stock is 6 million, what is the number of cattle produced? 8. The total number of pigs, camels and donkeys is ___. 9. An instrument used for setting out right angle in surveying a parcel of land is ___. 10. An example of a great circle is ___. 11. A metamorphosed form of shale is ___. 12. Sandstone can be classified as ___. 13. A Karst feature in its advanced stage of development is ___. 14. The common features of the middle course of a river are ___. 15. A form of chemical weathering is ___. 16. Ocean currents affects the coast they wash ___. 17. Wind vane is used to record the ___. mean annual temperature of 27° C? 19. Which of the following types of vegetation is characterized by acidic soils? strongly by the topography is ___. 22. Which of the following resources is non-renewable? 24. An example of a climatic hazard is ___. 25. In which of the following regions is high population density attributable to the agricultural following development? 26. Which of the following statements best describes the population of South East Asia? 27. Which of the following population characteristics is associated with developed countries? 28. Urban settlements mainly engage in ___. 31. Which of the following economic activities are classified as primary? enterprises, it is referred to as ___. 33. Most less developed nations are trade debtors because ___. 34. Production is associated with the ___. 35. Liberia, Malaysia and Indonesia are known for the production of ___. 37. The Mediterranean fruits are exported mainly to Western Europe rather than Africa because ___. 38. The contribution of agriculture to Nigeria’s GDP has remained largely low owing to ___. 39. A boat building industry is least likely to be situated in ___. 40. In Nigeria, bay and headlands are features associated with the ___. 42. Nguru and Kaura Namoda settlements in Northern Nigeria are most notable for ___. 43. 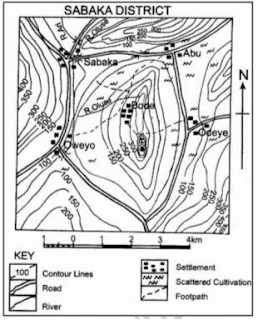 The scattered settlement pattern of the Tiv of the middle Belt is owing to the ___. Use the diagram below to answer question 44 and 45. 44. The area marked S is ___. 45. The area shaded R is ___. 47. Which of the following African countries is landlocked? 48. The relief system in East Africa is characterized by ___. 49. Lake Kariba is in ___. 50. Improved agricultural production in the Cote d’ Ivoire is mainly due to ___. D. Good organization and effective management.